The Democratic Republic of Congo (DRC) is a country with significant resources. Its surface area of 2.3 million square kilometres (km) spans the equivalent of two-thirds of the European Union. Despite its vast expanse, the country remains virtually unconnected due to the lack of basic infrastructure, agricultural production, and notable industrial base. As per the CIA World Factbook, only 2,794 km of paved road exists along with only 4,000 km of railways leaving the country disconnected and the population without access to affordable domestic transportation. In contrast to this reality, the DRC, with 80 million hectares of arable land and over 1,100 minerals and precious metals, has the true potential to be one of the richest countries on the African continent and a significant driver of African growth. GDP has suffered over the past few years due to political instability and the mining ‘bust’ following the global financial crisis. The five largest banks hold approximately 60 per cent of all these assets. 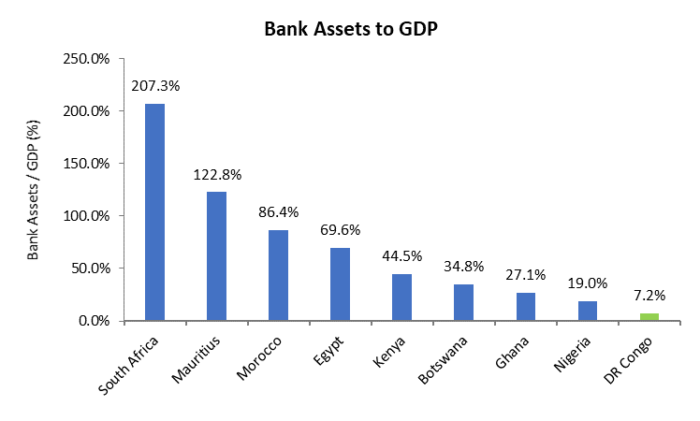 Bank assets to GDP is only seven per cent, which is perhaps the lowest of any country in the world. Furthermore, banking penetration ranks at the bottom of regional peers, with only seven per cent of the population holding a bank account. A highly conservative and short-term credit appetite of the sector, while constraining economic growth, perhaps also insulated the banks during the economic slow down. With the exception of BIAC and FiBank, the sector has recovered from the downturn (BIAC was placed under administration in 2016 and FiBank was dissolved in 2017). Currently, only a couple of investment funds, backed by development finance institutions, are extending credit to small corporates and large SMEs in the DRC, filling in for the near-absence of term bank credit. Furthermore, a number of multinational microfinance banks have established significant activities in the country: Microcred acquired Oxus DRC in 2017 and FINCA grew its asset base by acquiring iFinance in the same year. Such institutions have supported the economy with credit at the bottom of the pyramid. In order to meet the demands of a growing DRC economy, the banking sector will need to overcome various challenges, including the lack of infrastructure, which exasperates the challenges and expense of cash handling, and rising inflation in a dollarised economy. While much of the urban economy uses US dollars as its functional currency, it remains a foreign currency. Bank charges for the withdrawal of US dollar notes and for US dollar transactions are an exorbitant frictional cost. In an attempt to mitigate such costs, suppliers set up bank accounts with the same banks as each of their largest customers, creating a myriad of bank accounts. In the microfinance sector, USD loans were commonplace, including in peri- urban and rural areas where traders are earning the local currency, the Congolese Franc, which in the light of the recent devaluation has led to financial stress on such micro-entrepreneurs and a weakening in portfolio quality in the sector. Increasingly microfinance banks are looking at means to mobilise local currency deposits or other funding, to fund a greater proportion of their loan books in Francs. Similar to steps taken in markets such as Zambia and Ghana, the Central Bank of Congo (BCC) has directed that all banks must raise their minimum capital to $50 million by the end of 2020. Banks have a number of options, to sell and exit, to merge, to raise capital or to step down the regulatory hierarchy to be a non-bank lender or microfinance institution. Bank Byblos, from the Lebanon, so far is the only bank to begin exiting the market via a sale of its portfolio to one or more of its peers. Given the low banking penetration rate, poor recent economic performance, and optimism over future economic growth driven by a new mining boom, we foresee a significant consolidation amongst the two-thirds of the banks in the country holding the remaining 40 per cent of assets. As most of these banks are foreign-owned, the continued financial commitment by the parent companies or principal shareholders is reluctant at best and unknown at the worst. The stage is set for an existing operator amongst the ‘lesser’ two-thirds of the banks, or even a new entrant, to step in and act as the driver of consolidation. Such an initiative can be handsomely rewarded over the long term as FDI should recover with mining investment, energy and road infrastructure will be built out to support such mining investment, and agricultural output should continue to increase to meet the needs of a population growing at 2.7 per cent per year. Further reforms within government institutions and implementation of various projects, including the digitisation of the national land registry, should only help drive credit growth. New entrants, as well as existing players can harness new financial technology. Examples include FINCA and Vodacom’s mobile wallet which provide savings and payments solutions to many in rural and peri-urban areas. Trust Merchant Bank’s Pepele mobile banking solution offers a similar capability. Such technology has its applications across the continent but is perhaps most applicable in the DRC given the challenges and costs imposed by physical distances, poor infrastructure, a dual-currency regime and low transaction sizes. With a fair wind from politics and commodity prices, these catalysts – consolidation, capitalisation and adoption of mobile technology- will allow banking penetration to increase in the hands of much more stable and profitable banks.